Summary: A Westmoreland County car wash gives a new meaning to multitasking. 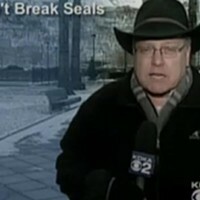 Reporter: Dave Crawley, KDKA Channel 2 Airtime: 1 minute, 53 seconds on Jan. 7. 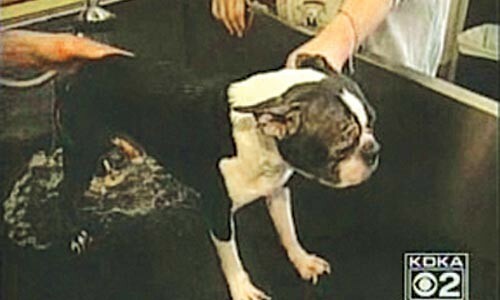 Visuals: * A Boston terrier who doesn't seem to be enjoying his "self-serve" hose-down at all ... * The "de-skunk" selection on a shampoo dial at this unique servicing station. Highlights: * When anchor Patrice King Brown begins, "It is the time of year when cars and dogs get very dirty." * When Crawley expounds, "The car wash is a busy place in slush and road-salt season, but Aquajet Express on Route 30 in Jeannette has taken a bit of a detour." * When Crawley reports from the driver's seat of an SUV, the front windshield covered in soap as he cruises through the car wash: "After you clean the crud from your car, you can wash the mud from your mutt. This car wash has literally gone to the dogs." * When, as a man and his puffy little white dog skip by, Crawley crackles, "Jackson will get his Saturday night bath a couple days early. The self-serve dog wash is in the same building as the oil-change service. Ten dollars buys 10 minutes. Let the bath begin." * When Crawley says "Shop owner Kevin George says his idea was misunderstood at first," and George explains: "I think the initial idea is that we're gonna strap the dog to their car and run it through the conveyer." * When a male patron who is in the process of washing his dog says, "It's a really good idea. You ain't gotta make a mess in your own house in your sink." * When George boasts, "During that 10 minutes, you can cycle between three different shampoos, rinse, conditioner -- we have a de-skunk function." * When Crawley quips, "And that's nothing to sniff at." * When he adds, "Car fresheners share the vending machine with dog-wash mitts -- and of course, treats." * When George remarks, "We've added another thing that allows two or three or four things done in one place." What We Learned: Not much. Just another man-washes-dog story. Unanswered Question: When, oh when, will there be a car/dog-wash/beer store? News Value: 2. This car/dog-wash doesn't seem all that special, really, and will most likely prove a novelty. But it's worth watching just to see Crawley's gleaming eyes as he reports from inside his vehicle while on the car-wash conveyer, doing what he does best: spewing clichés!